Pai Hospital Vasco is among the pioneer IVF Infertility centers in Goa. We have the best infertility specialist and gynecologist which help you to overcome difficulties in conceiving. This multi-specialty hospital also provides best Laparoscopic surgeries and infertility treatments at affordable cost across Margo, Panjim and other regions of Goa. 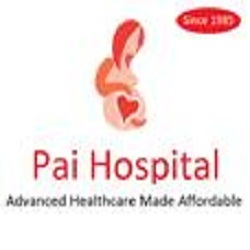 Company Overview: Pai Hospital came into inception in the year 1985, we specialize in providing advanced IVF treatment and offer all gynec facilities like pregnancy care, surgeries for the diseases related to all age group women. We also expertise in providing best key hole surgeries/ laparoscopy at affordable rates. Over these past 30 years, Pai Hospital has given very devoted and efficient service and has developed a long list of satisfied patients and completed families throughout Panjim, Margoa and other regions of Goa.